Twice around the clock, well not exactly. . . I was off to Daytona, again. I’ve been there a number of times over the years for everything from Rennsport Reunion, to test days and the Rolex 24. I’ve been to the Rolex 24 as a fan, as a vendor and as a car sponsor. This time would be different as I was working for a team that was competing in the twice around the clock race. In case you are wondering, no, they don’t let me drive. I am the PR guy for Mitchum Motorsports. I also shoot photos for the team. This year we were entering a Porsche 997 in the Rolex 24 along with our two Camaros we run full time in the GRAND-AM Continental Tire Sports Car Challenge. Our weekend started strong, with both of our Camaros finishing in the top ten in the season opener. The entire Mitchum team was feeling good about our results Friday afternoon. Both Camaros had struggled in qualifying yet finished with good championship points. No one said it, but I think everyone was hoping the same would hold true for the #86 Porsche in the 24. Mitchum’s driver lineup for the 24 included two-time class winner Randy Pobst and three rookie drivers – Joey Atterbury, Cooper MacNeil and Derek Whitis. 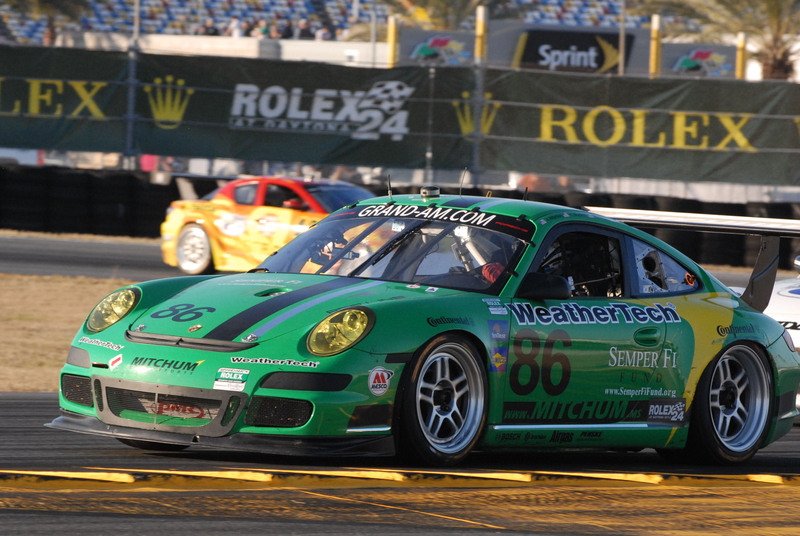 While rookie drivers in the Rolex series, all three have plenty of experience racing. 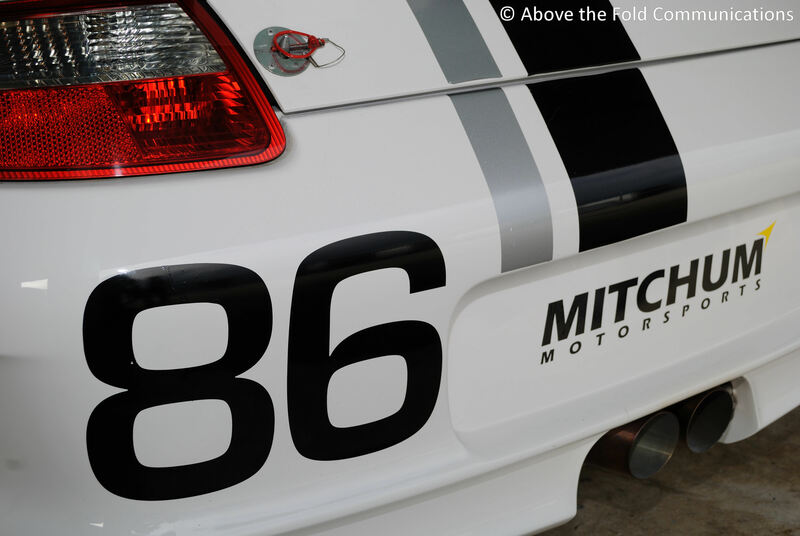 Atterbury competed in the Continental Challenge in 2010, Cooper placed second in the SCCA National Runoffs last fall and Derek runs Freedom Autosport, another Continental Tire team where he races Mazda MX5’s regularly. Our plan was to start our veteran driver, keep the nose clean and see where things shook out when the sun came up. Sounded pretty simple to me. Randy took the green flag at 3:30pm . 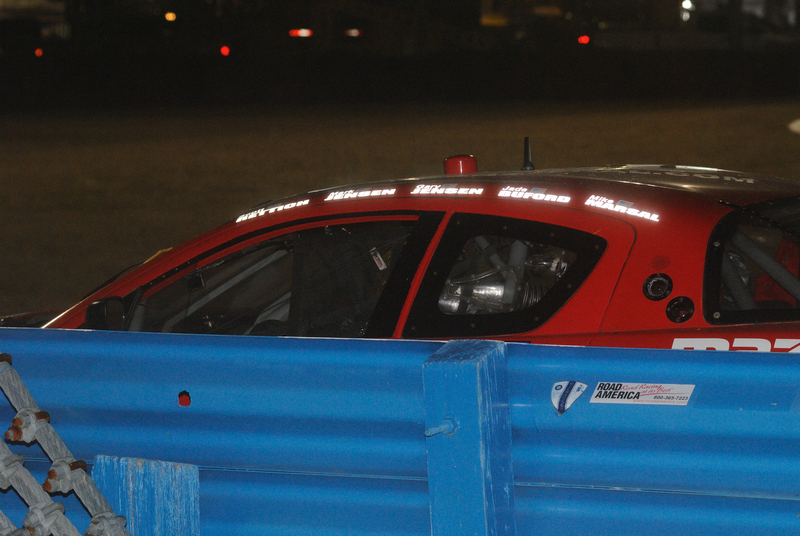 By about 3:31pm, as I watched from the photographers’ coral in the international horseshoe, the #86 car was into the outside wall. James Gue in the #41 Dempsey Racing Mazda RX8 made contact with our car and pushed Randy off into the grass and ultimately into the wall. I can’t express in words how gut wrenching it is to see your team car go off track and into a wall on lap one of a 24 hour race. It was almost surreal. The amount of time and effort, not to mention money, that goes into a Rolex 24 entry is mind boggling, and to see your hopes dashed on lap one is a feeling I don’t wish on my worst enemy. Randy off on lap 1. Over the team radio I hear Randy report he is in the wall and then a calm and collected Chris Mitchum (team principal) responds with directions to the driver and crew. We went straight to the garage to assess the damage and affect repairs. 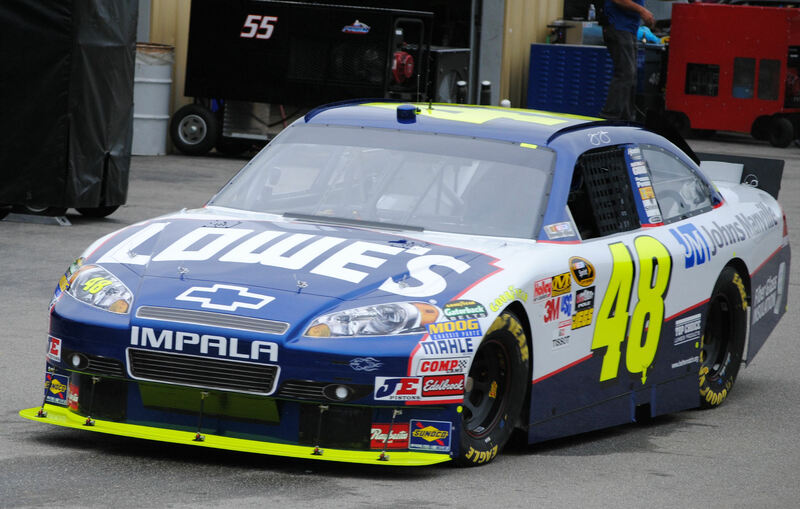 The team did an outstanding job of fixing what they could and getting the car back on track. Randy finished his stint, albeit with a less than perfect car, and turned the reigns over to Cooper who drove exceptionally well for his first Rolex race. Joey was next in the car for a double stint and he too kept the car out of trouble before turning it over to Derek just after the sun went down. Unfortunately another RX8 would cause problems for us. Heading into the infield portion of the circuit, the offending RX8 dropped fluid all over the racing line. Derek found the fluid before the flagmen did and he was into the wall, further damaging the left side of the car. After another trip to the garage Derek was back on track and keeping a good pace. We weren’t going to get our laps back but if you follow endurance racing you know that just by clicking off laps you can often improve your position – lots of cars have problems over the course of the race. Sometime during Derek’s stint, while I was once again shooting pictures in the international horseshoe, I got to experience the impact of a car first hand. As I stood against the blue guardrail I was panning my camera to capture an image of a car rounding the corner, I heard the crowd behind me get really loud all of sudden (keep in mind I was wearing a crew headset and cars were racing at speed so it is hard to hear much of anything). It suddenly registered with me that something was happening near me so I spun to look back down the track toward pit out. Just as I turned my head another RX8 slammed in the guardrail exactly where I was standing and abruptly came to a stop. Water from the tire barrier splashed on me just as I felt the impact. Wow, that was close! After the car was pulled out and taken to the garage I did notice a few of my fellow photographers giving me nods and smiles – signally they had all been there before and they knew the feeling I had just experienced. No harm, no foul, right? Once my heart rate returned to normal I started snapping pictures once again. I also swore that I wouldn’t tell my wife Laura this story, oh well. Back to the race. Derek would find himself in the garage again after a big spin in the bus stop. The car was towed back slowly as we were concerned we had lost the engine. After a thorough checking out of the car, including a visit by a Porsche Motorsports engineer, it was determined we were ok. Cooper would head back out on track for his second stint of the race. After just a couple of more laps I heard the call on the radio that we were off in the bus stop again. 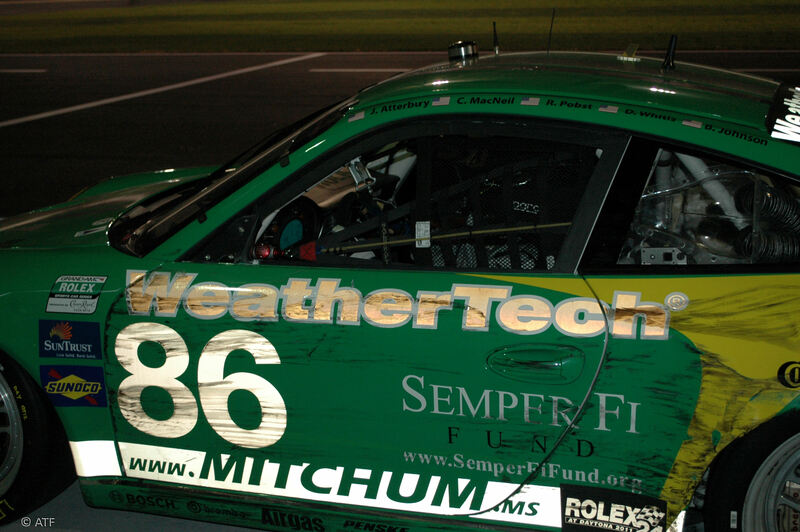 This time there was contact with the wall which would put an end to our Rolex 24. The entire crew worked so hard leading up to the race and especially during, in order to keep the car racing. It was definitely a huge disappointment to not finish but a great experience none-the-less. The 86 shows some wear after multiple on track incidents. If you have never been to the Rolex 24, I highly recommend it. There really is nothing else like it in this country. 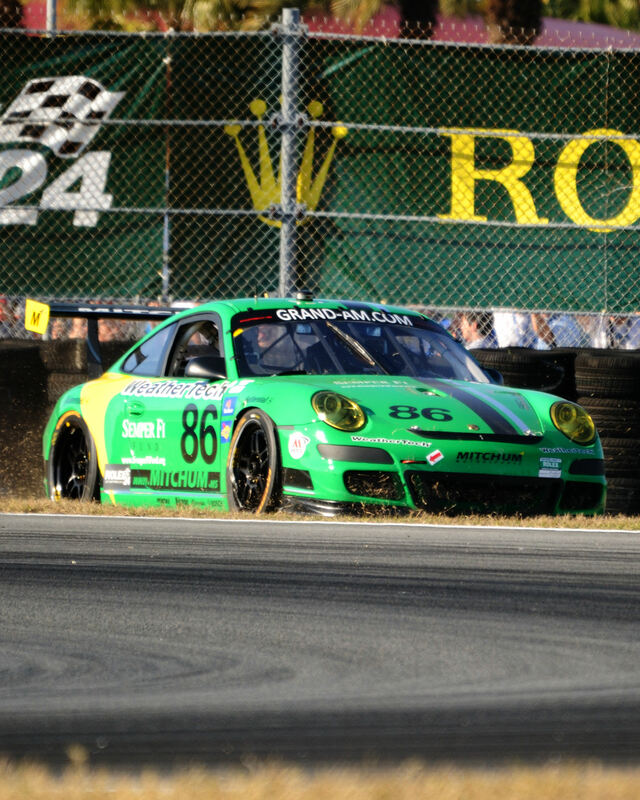 The Sebring race is only 12 hours and the six hours at the Glen is, well, just six hours. To put this race length into perspective, we raced for about nine hours before we had to retire. I found a hotel room at about 2am Sunday morning after packing up my gear at the track, slept for a few hours, hopped on an earlier flight which touched down in Manchester at 3:15 in the afternoon. As I was walking down the jet way it occurred to me that the race wasn’t even over yet. It’s time for the Roar before the 24 again. Three final days to get the cars, drivers and crews ready for America’s premier sports car race – the Rolex 24 at Daytona. 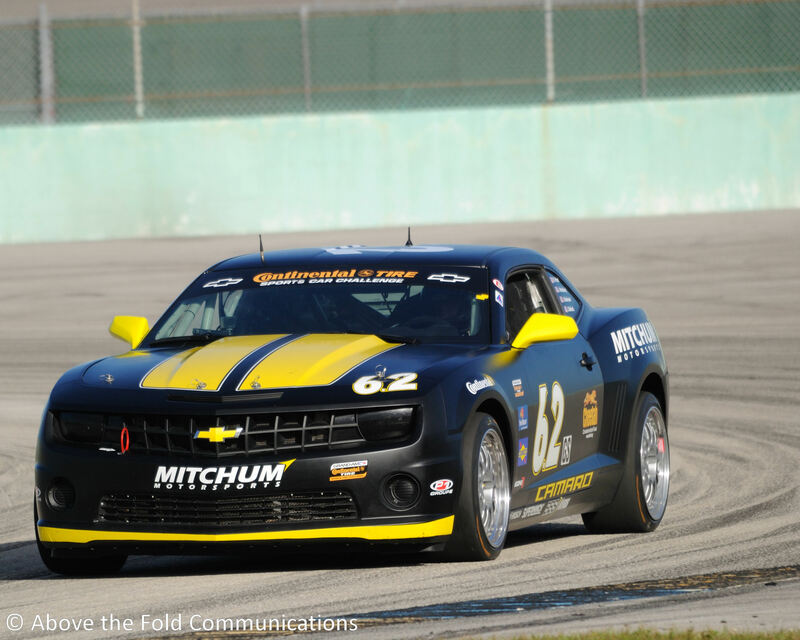 I am headed to Daytona with Mitchum Motorsports to support their two car effort – the #6.2 Camaro in the Continental Tire Sports Car Challenge and the #86 Porsche in the Rolex Series. This isn’t my first trip to the twice around the clock race, but it is the first time as truly part of a team. Last year I was there as a sponsor of the #99 Gainsco car as well as a Mustang in the Continental Tire series. Prior years I was there in a vendor role, showing off iRacing.com to the teams and fans. I am really looking forward the opportunity to document this historic race for Mitchum Motorsports in both words and images. The Roar Before the 24 will serve as a warm-up for the team. We’ll find the right setups, practice pit stops and get comfortable with everything. I’ll do the same and find some spots to shoot the cars on track as well as work the media center to get the word out about Mitchum’s two cars.